It was a busy year for information and communications technology (ICT) at MaRS. Although 2014 is not over quite yet, we wanted to share some of the highlights of the year and give kudos to a few startups. Some big names came to MaRS this year to share their founder stories and thoughts on innovation. 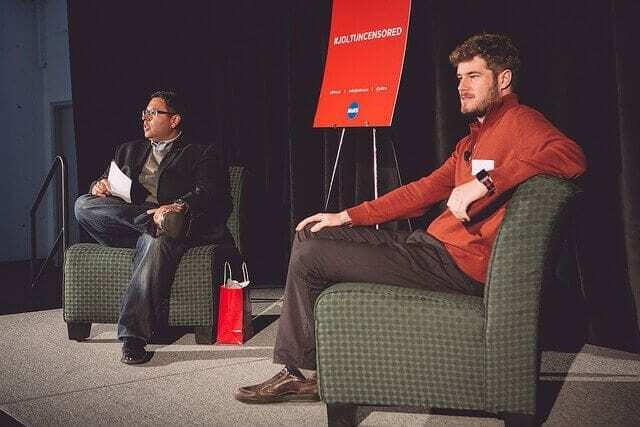 Canadian entrepreneur Eric Migicovsky, the founder of Pebble, spoke at a JOLT Uncensored event and had a very down-to-earth conversation with Salim Teja, executive vice-president of ventures at MaRS. Nolan Bushnell, the founder of Atari and Chuck E. Cheese’s, shared stories about giving Steve Jobs his first job in Silicon Valley and building a company from the ground up. Walter Isaacson, president and CEO of The Aspen Institute, spoke about global leadership and urban innovation centres at a MaRS Global Leadership event. See his talk—and shout out to MaRS!—here. We also launched a new speaker series, MaRS Mornings, where we hosted the unveiling of Michael Serbinis’ new venture, League. The series also hosted a panel of female founders (Eve Medical, Open Source Health and Damiva) who are building companies focused on revolutionizing healthcare. Canadian entrepreneur and founder of Pebble, Eric Migicovsky (right), spoke at a JOLT Uncensored event with Salim Teja, MaRS’ EVP Ventures (left). MaRS’ Digital Health cluster got off the ground in 2014 and partnered with Health 2.0 to give digital health a home in Toronto. They held two successful meetups in 2014: the first with Geoffrey Clapp, co-founder of Better; and the second with the top early-stage investors in digital health. To read Geoff’s excellent recap of the Health 2.0 event and his experience at MaRS, see this post. We officially launched the Financial Technology cluster at an Entrepreneurship 101: Meet the Entrepreneurs panel with four founders building in the space. We hosted several hackathons here at MaRS, including the PayPal BattleHack, the Mastercard N>XT Developer Challenge and the EdAppHack Student Hackathon. Also, our Educational Technology team took its show on the road and threw the closing night party at SXSWedu in Austin, Texas. MaRS ventures hustled to raise capital and JOLT announced that its portfolio of companies has collectively raised $10.5 million in financing. With another cohort still on the go, look for more exciting announcements from the JOLT alumni. We hosted events for our female founders, including an intimate round table discussion with strategic business consultant Daphne Kis, who shared her reasons for investing in female-led companies and gave the founders in the room advice on how to tell their stories to investors. Annelies van den Belt-Jansen, CEO of DC Thomson Family History, visited the MaRS Commons and shared her experiences building businesses and how her daughter inspired her to support other women in tech. Special mention: Finally, a special mention goes to ICT advisor Aron Solomon, who participated in Ontario Premier Kathleen Wynne’s trade mission to China. Aron and Ilse Treurnicht returned having signed a memorandum of understanding with Shanghai Technology Innovation Center, one of the largest accelerators in Shanghai. We’ll have more exciting events and speakers in 2015. And if you’re a MaRS venture with exciting news from 2014, please share it with me on Twitter! If you’re interested in becoming an ICT client at MaRS, check out what MaRS Venture Services offers and see if your company is eligible to apply.